The key question in bite evaluation is “Can this person chew comfortably, with no pain and without tooth wear?” The chewing system is very complex and early signs of disease are subtle. Coordination among the two jaw joints, the chewing muscles and the teeth is necessary for healthy function. The long-term health of this system is dictated by the harmony among these three components and their ability to adapt to changes over time. When the body cannot accommodate excessive force in the chewing system, the weakest link in the system will be affected. In some instances the jaw joints may become tender and, over time, can result in irreversible changes to the joint. Sometimes the muscles will be overworked, causing muscle pain and headaches. When the teeth are affected, they become loose or worn—teeth that are aging faster than the person. Unfortunately, it can take years for some signs and symptoms to appear. Tooth wear, in particular, may not be noticed until significant loss of tooth structure has occurred, because the wear may be slow and tolerable in the early stages. If the disharmony can be caught soon enough though, extensive rebuilding treatments may be avoided. Due to the subtle nature of functional problems, it is essential that this risk be identified and managed at an early stage of the disharmony. A well-trained dentist can determine if the condition occurred in the past or is currently destructive. Once a proper diagnosis has been made, destructive patterns can be altered, often halting the ongoing breakdown. The cause of the destructive patterns will be identified, then treated or managed to allow both teeth and dentistry to last as long as possible. 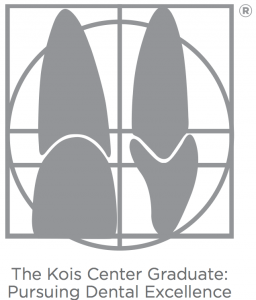 Kois-trained dentists may use a removable appliance to determine how best to treat the excessive forces. Once the cause is determined, the risk for future wear or pain can be reduced by reshaping the teeth to correct the bite or possibly repositioning the teeth so the jaw joint, muscles, and teeth are in harmony. Final dentistry can then follow, in the newer, more comfortable position. Some people squeeze, clench, or grind their teeth even with excellent tooth and jaw alignment. For most people with this condition, the greatest damage occurs during sleep. In this situation, risk reduction can be achieved by the use of a nighttime appliance to protect the teeth.